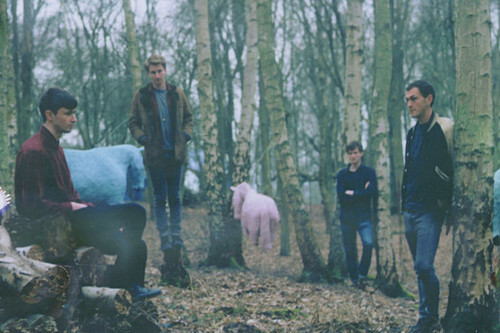 Glass Animals brought their tour to Liverpool, East Village Arts Club, on Sunday night as the mid-point of their short UK tour. Setting the standard were the warm up acts of The Etches and Women’s Hour who entertained the sparse crowd before the main event. They were very left field and interesting, but they both left a feeling that something was missing – there was a lot more to be desired. Their performances certainly fell flat. Maybe it was the low attendance killing the atmosphere, but it was hard to really get into the swing of things. Glass Animals, however, I felt were very impressive, with slow deep melodic grooves that set the crowd bopping with a mix of old and new songs, renewing my appetite for this gig. For such a new band, that are obviously working with their sound, it was good to see the enthusiasm and passion that they gave to their live performance. Even though there wasn’t much of a crowd they seem to just love playing. Songs such as ‘Exxus’ and ‘Cocoa Hooves’ were very well executed with a very tight set. Other songs, such as one of my favourites ‘Golden Antlers’ also had people dancing and forgetting the fact that they’d obviously spent too long in the bar during the first acts. Finishing with ‘Black Mambo’, which was almost seductively dark. The lyrics were hard to shrug off, leaving me humming the song for the next couple days, showing that this band definitely have the potential to be something special in the line of ‘Wild Beast’ or ‘Tourist’. Overall, although the gig started slowly, it picked up towards the end with the appearance of Glass Animals oozing with originality and new shapes. Definitely well worth taking a look.